Only members of LinkedIn can be part of anyone’s network. Therefore, if you want to send a connection request to someone who hasn’t yet joined LinkedIn, you must invite that person to create a LinkedIn account first. You can either send your invitee an e-mail directly, asking him to join, or you can use a LinkedIn function that generates the e-mail invitation that includes a link to join LinkedIn. Either way, you need to have the nonmember’s e-mail address, and you’ll probably have to provide your invitee with some incentive by offering reasons to take advantage of LinkedIn and create an account. Click the Add Connections button at the top right of the LinkedIn home page. The Add Connections window appears. Click the Any Mail button. In the middle of the page, under the header “More ways to connect,” click the Invite by individual e-mail link. This brings up a text box. 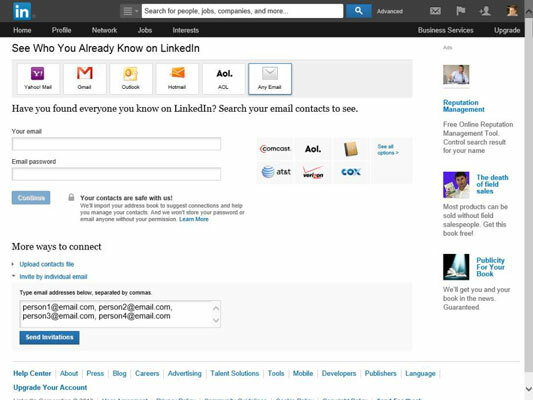 Fill in the e-mail addresses of the people you want to invite to LinkedIn in the box provided. Because you can’t personalize the invitation request to nonmembers, you may want to contact those people via e-mail or phone first to let them know this request is coming and encourage them to consider joining LinkedIn. Click the blue Send Invitations button. You’re returned to the Add Connections page, where you see a confirmation message. You can repeat the process at any time to invite additional people to join LinkedIn and be added to your network.